*1st place, will receive 45% of all entry money. *2nd place, will receive 25% of all entry money. *3rd place, will receive 10% of all entry money. There well be the biggest carp mug trophy and side pot money. Entry fee $25.00 per. Person. 1.Winners will be determined by total weight caught. 2. Only carp will count for total weight. *3. Each tournament angler will be allowed to have a net Man or runner to help with netting in handling of the fish net man may not touch the rods or reals in any fashion. 4. when you get your peg. You must fish straight ahead. please do not cross other anglers lines. Good etiquette is required. No profanity. No loud music. Must keep area clear of trash and take all trash out with you. 5.Once you caught your fish. Call the weigh master on your cell phone. The weigh master will come to your area, to weigh your fish when the weigh master is ready to weigh your fish. Then a air horn will sound off. To notify players that a fish is being weighed. Dead fish wil not be weighed. 6.Good carp care is the up most importance. All carp shall be released back into the lake. 7.Tournament director and /or weigh master will have final say on any issues that may arise. 8.You are allowed 3 poles. One hook per line. (no treble hooks.) Up to 3 poles. 9. please be there early to sign your entry waiver. Before an hour of each Tournament. There will be a peg draw 30 minutes before the tournament starts. when we pull your name out of the bucket. That angler will chose his/ her's peg around the lake. 10. Acts of cheating, violence, and blatant disregard for the tournament rules by either team member will be grounds for automatic disqualification and removal from the tournament. No refunds will be given. *11. The trophy's and prizes are paid out by the entry fees. 1.st 2.nd & 3.rd place will be receiving 80% of this money. 12. We take the entry fee 1 hour before the tournament. If your late before the peg draw. You can get the next available peg that you would want. 13. You can chum but must wait until the tournament starts. 14. This lake is a catch an release lake. Only residents that live here can fish on this property except for on tournament day. 15. 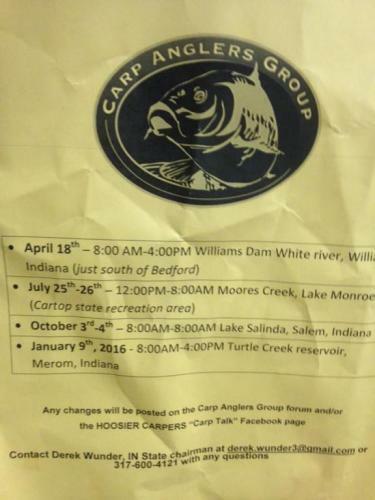 If there's no carp caught at the end of the tournament see rule #7. 16. At the end of the tournament you will hear an air horn. The tournament is over. If you have a fish on before the air horn goes off. Please notify the tournament director. So we can get your carp weighed. 17. There will be award ceremony at the end of the tournament with a prizes. 18. The top 6 man shootout championship tournament. Every first place winner from each tournament will qualify to be in the top 6 man championship shoot out tournament. In October. $50 bucks to enter the tournament. The 1.st place winner will receive the half of the championship $$$ and gets the championship trophy. There will only be 2 qualifiers for the championship of champions. winning money will be the entry fee to that Tournament. Then those 2 Anglers will go to represent Team Fish Fighters. In November. 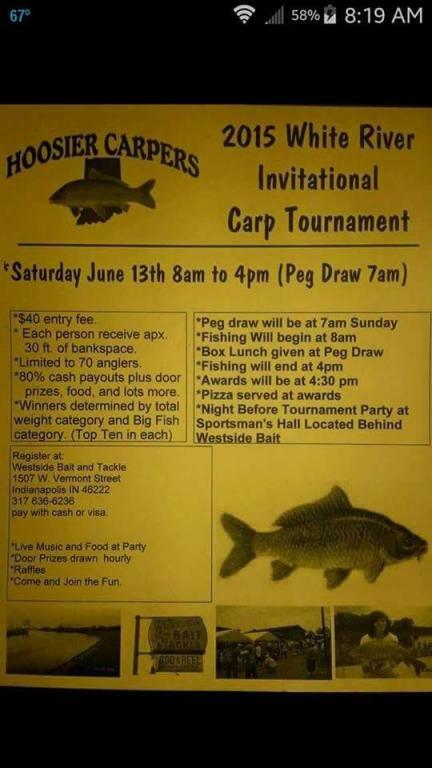 Also if that first place winner can not make it to the six man shoot out tournament then the second place winner will take his spot or vice versa if that third place winner can't make it then that person will choose his or her own angler. 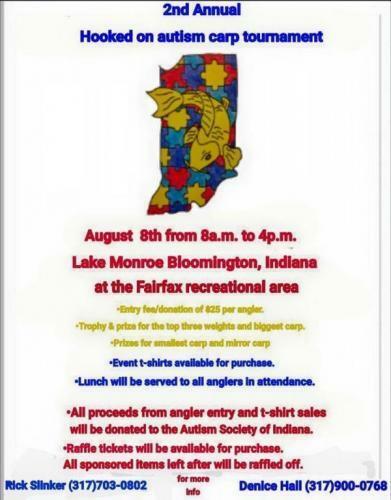 Sponsors already on board for the 2nd annual Hooked on autism carp tournament.